Ben Nelson, a senior in the Auburn University College of Sciences and Mathematics (COSAM), is the first in his family to attend college. The Opp, Ala., native, who was raised an Auburn Tigers fan, plans to use his Auburn University education to become a surgeon. “I grew up on a farm, so I like building stuff and working with my hands,” Ben said of his career choice. Ben received an Auburn University Spirit of Auburn scholarship to attend Auburn, and was also awarded the Dr. Larry Wit Honorary Endowed Scholarship. 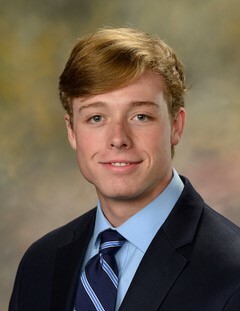 Ben said the COSAM Pre-Health Professions Program, which assists students applying to professional schools, has been one of the most useful aspects of his Auburn University education. Ben has already been accepted into the University of Alabama (UAB) at Birmingham School of Medicine. Ben said the work of Beverley Childress, director of the Pre-Health Professions Program, has been a great help to him. Ben has taken opportunities to learn more about his future career field through a Summer in Biomedical Sciences Internship through UAB and is currently working in an international outreach internship at the Edward Via College of Osteopathic Medicine where he assists in packing supplies and inventory for medical trips to underserved countries. In his free time, Ben sponsors a little brother through the Project Uplift volunteer program. Ben serves as a Peer Advisor and Research Ambassador for COSAM and said he enjoys helping other students through these roles. COSAM Student and Research Ambassador, Ben Nelson.